Over the years a number of projects have been proposed downtown that, for one reason or another, never came to fruition. The clear lens of hindsight shows us that ultimately some of these projects were probably doomed from the start and the city is probably better off without them. Some might have been wonderful additions to the built environment. In most cases we’ll never know. Below is my top 10 list of unbuilt projects in downtown Ann Arbor. Proposed back in 2008 by local owner Bruce Thompson, this development was to be a re-purposing of the existing structure, formerly home to an A&P. Described as a mixed-use “Italian village”, it looks more like a suburban strip center. The site was eventually demolished and is now home to the Foundry Lofts. Back in 1969, Ann Arbor Bank proposed building an 8-story office building at 109-113 South Main. Just after Tower Plaza turned the tide of high rise development in Ann Arbor, the building did not comply with new restrictions on height and setbacks. Given the character of Main Street and the quality of 1960’s buildings, this is probably not one to cry over. Nowhere near downtown but no list of unbuilt projects in Ann Arbor would be complete without mention of Tom Monaghan’s crazy plan for a 30-story slanting tower up on the northeast side by Domino’s Farms. 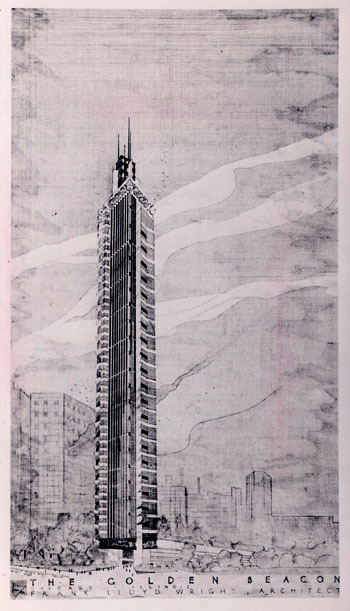 The building was to be loosely based on a Frank Lloyd Wright project called the Golden Beacon that was conceived in 1956 but never built. The whole thing is wild but the only thing that ever came out it is a 50-foot scale model out at the site. This 9-story mixed-use project was proposed back in 2005 by Joseph Freed & Associates at the corner of Glen and Ann. Like so many projects, its prospects were killed off by The Great Recession. A fairly decent if uninspiring development, it may have found its way higher up the list but it has since been supplanted by the upcoming The Glen project on the same site. On the borders of what one might call downtown, this residential project was once planned for the corner of Madison and 4th. This 5-story, 63-unit project with underground parking seems almost ho-hum now but in 2009, it brought out a veritable NIMBY uprising. Back in 2010, a partnership between Avalon Housing and Three Oaks Group received approval for Near North, a 39-unit affordable housing project on North Main Street. Ultimately, Avalon determined that the project was no longer feasible and the site plan lapsed. The site is now planned for market rate townhouses. The Gallery (which confusingly shares its name with another recently approved condo project at Ashley and Jefferson) was a $67 million, 11 story condo building once approved for the former St. Nicholas Greek Orthodox Church on Main Street. It seems the project was unable to secure financing and new townhouse condominiums were built there in 2013. This one goes back to the 1980’s, I had never heard of it but it was mentioned in a Facebook post in the Ann Arbor Townies Only! group. Back in 1988, local developer Herbert Schneider proposed building a 14-story office and condominium building at 410-424 South Main. Details are a little hard to come by from the pre-internet era, but I a couple of historic homes were moved all the way down to Huron Parkway to make way for the project. Apparently they got as far as digging the hole for the foundations before the project fell apart and they used dirt from the further excavation of the Michigan Stadium field to fill the hole. It is now the site of the Ashley Mews development and DTE building. Two different projects were proposed for the former car dealership lot at Division and Washington, a nine-story apartment project by locally based McKinley, immediately followed by a 120-room hotel concept by Chicago-based First Hospitality. Either would have been an improvement over the current surface parking lot. This project for the so-called Kline Lot in downtown Arbor might have topped this list if not for the scant details available. Proposed back in 2010 by developer Ron Jana for the city lot at Ashley and William, the building would have housed a hotel, conference center, workforce housing, and retail across 525,000 square feet. There would be underground parking and the project was to be a public-private partnership. I’m not sure this one ever got off the drawing board but I personally would love to see it revisited. Probably the most high profile project in recent years (and the subject of a new and controversial building) is the Library Lot Hotel & Conference Center as proposed by Valiant Partners back in 2011. A wild modernist design to be sure, it would have provided an impressive conference center option downtown but ultimately the city was to be a financial partner and that proved untenable. Not as big as the other projects at the top of this list, Tierra on Ashley was just bold and unique and was intended to replace a long vacant service station. Proposed by local engineering and consulting firm PMA Consultants, the building would have had two stories of retail, two floors of offices for PMA, and condos above. Environmentally friendly and bravely modern, Tierra could have been an exciting addition to the west side of downtown. Of all the unbuilt projects on this list, William Street Station is the one that stings the most. Perhaps because the site is still languishing as a vacant lot. Perhaps because the AAATA ended up rebuilding the Blake Transit Center next door in a severely limiting mid-block sliver of land. Perhaps just because it was such a cool project. A true mix of uses, the twin towers managed to fit in 100 units of affordable housing, 219 hotel rooms and conference space, 55,000 square feet of office, and a new transit center on the ground floor. Huge and perhaps overly ambitious but hey, it was the mid-2000’s, anything was possible. When the economy turned developer HDC asked the city for more time to put the project together and was rejected. Ultimately, I’m not sure they would have ever gotten it off the ground but now we’ll never know. I’m sure there are other projects that have come and gone, some no more than a glint in the eye of some ambitious aspiring developer, others going so far as earth moved and foundations laid. If anyone has a story about something from way back in the archives, please share in the comments. OMG, you have done something to my brain. I remember most of these. Putting them together like this has a serious impact. Great review. Is it just me or has the city seriously botched the sale and development of the Y Lot? Plenty of other factors to be sure, but still. I’d have to agree with your assessment. I’ve been frustrated with the way they handled it for a long time, as you might guess from my post. Now they are the target of a second lawsuit coming from that location, not a good sign. The space where Ashley Mews was built, and the Edward Robinson space (at the corner of Main & William) were (briefly) known as “Twin Pits” – riffing off of the (recent for the time) “Twin Peaks” TV series. Main Packard Development Project was proposed on the site of Ashley Mews in the late 1970’s – the land was initially going to be the Packard-Beakes Bypass. I was the Architect.